In the last few days we have learned of the dangers of goalkeeping. And I don’t mean the foolishness of England’s Paul Robinson, who tried to whack a back-pass away without first bringing it under control, only to see it roll into the net in the 2-0 defeat by Croatia. No, the dangers I refer to are the real possibility of injury because goalkeeping is an inherently dangerous occupation, sometimes made worse by the inattention of the referee. The big guy on the right of the group of soccer players in this photograph is Glenn Myernick, assistant coach of the U.S. National team in World Cup 2006. 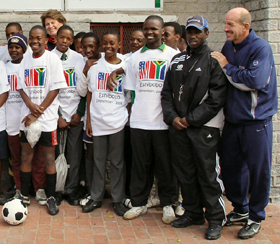 The players are from Langa High School in Pretoria, South Africa, and they are getting ready for a clinic given by Myernick as a U. S. State Department Sports Envoy in a three-city visit to South Africa during September 13 through 20, just a few weeks ago. When I opened my e-mail this morning, the first message I saw was one telling me that Myernick, known to most of his friends and colleagues as "Mooch" died today after suffering a heart attack four days ago. He was fifty-one years old. By now most of you have read the article by freelance-writer Steve Davis from Dallas. It is being circulated among referees here in northern California, and I am sure that elsewhere in the country, officials are nodding their head at Davis’s comments. If you haven’t seen it, check out the link I provided in my last blog on this site. Let me add a little different perspective to Davis’s comments.